Thank you for addressing my concerns about the quality of a recent home energy audit performed by a member of your staff. Upon receiving my letter you quickly responded and offered a resolution. You returned my money and offered a re-audit at no charge. I truly appreciate the personal and expedient feedback you provided. It is a rarity. Your re-audit of my home provided new information and a detailed list of improvement opportunities. Our discussion following your audit helped prioritize of the future work to reduce energy consumption and improve my home's air quality. You identified several opportunities for improvement that I would never have suspected. It is hard to find service providers that stand behind their work. Your complete remediation of my concerns proves that you are one who does. Thank you. I would like to take a moment and tell you how well of a job your crew did. They took extra steps to clean everything up after the end of each work day. I look forward to doing business with you again. Thanks again and talk with you soon. PS - If you enclose some business cards I would be glad to recommend you to anyone I know. I would like to recommend Troy Tanner, President of The Home Energy Detective Inc for the 2008 Mayor's Small Business Award. Mr. Tanner has shown his tremendous business acumen in developing a small business that combines his experience in the remodeling field with his knowledge of residential energy usage. This is a combination that is rarely seen in our industry and frankly is essential as we all work towards using our energy more efficiently. The combination allows him to know what needs to be done from an energy perspective and how to best achieve it through his knowledge of building construction. Mr. Tanner believes in what he is doing. This shows very clearly to the homeowners in Arlington whom he has helped to better understand their energy usage. He is a people person, who takes time to explain sometimes complex systems to a wide variety of audiences. He is very effective in a field that can be somewhat bewildering. His effectiveness in relating to people has been proven by several media requests to provide information on home energy audits. 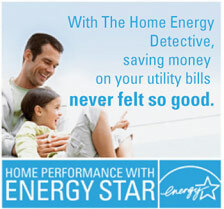 He has been interviewed both on the air and on television about ways that homeowners can reduce their energy costs. Mr. Tanner demonstrates the type of small business that is a tremendous asset not only to Manassas but to Virginia as a whole. As we all search for ways to reduce our energy-related budgets, we are fortunate to have solid citizens like Troy Tanner help us. He has been a tremendous help to us here in Arlington. Just a quick note to thank you for your visit yesterday. As I said, if I had done this eight years ago, I could have easily saved more than $10,000. Even so, I have already begun to fix the simple things. Please feel free to use me as a reference. I look forward to your visit on July 18th. Take care and happy 4th. I think he's on the high end of pricing, but we had a lot of work done. For $350.00, we had a home energy audit where Troy assessed all the leaks, drafts and so on in our house. This took about 3 hours. Based on that, we came up with a list of things to do, he helped us rank what we could do ourselves (we can be pretty handy) and gave us an estimate for the work that he and his crew would do. We hired him to do the attic and crawl space under our addition. For the attic, he cleaned the whole thing out (not the junk, but the old insulation and such), sealed all crack/openings, insulated duct work, blew in cellulose, built a deck over that for storage, and lined the roof with reflective sheathing. The result is to be an attic that doesn't get above about 100 even in summer. We are very happy with the work as well as with Troy and his crew. They were VERY clean, on time, and did everything promised. Given that our access is in our master bedroom and that we have a toddler, they were really good about keeping their tools to the workspace and cleaning it up enough that we could sleep up there each night. Your repair crew led by Mike Shepherd did an excellent job improving the thermal envelope in the attic of my home in Arlington Virginia. I believe my home will be appreciably cooler in the summer and warmer in the winter as a result of their work. After removing the attic floor boards and all insulation, they foam sealed all the electrical and plumbing penetrations and all top plate openings. They installed 2x6s to raise the attic floor to accommodate new blown fibre installation to an R-38 level. They installed Reflectix to the attic rafters, taped all the seams, and replaced the attic floor. Finally they installed an air-tight, removable, insulated hatch to access the attic. Mike and his crew were invariably courteous and accommodating throughout the several days of the project. To prevent any dust from soiling my living area, they taped up a plastic barrier. They frequently vacuumed. When they competed the project not only was my attic newly clean and neat, but all of the areas of my home which they used to access the attic were immaculately pristine. Mike Shepherd is obviously very experienced and successful in putting at ease all occupants while he and his team are at work in their home. I'm please to give Mike and his crew my highest recommendation for the work they did in transforming my attic into one that will save energy and add to my comfort in summer and winter.